This statement was made by a patient interviewed in a new research study on informal payments in health services in Vietnam. Although it cannot fully capture the complex causes and consequences of informal payments, it provides a hint of the difficult choices faced by health care professionals and patients. In Vietnam as in many other, including a number of European, countries informal payments in health are widespread. 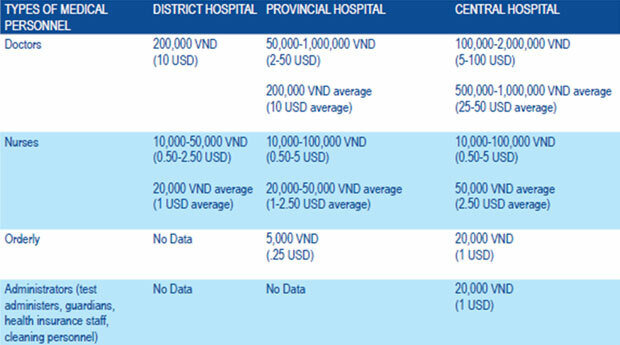 More than 30% of respondents in the latest edition of the Vietnam Provincial Governance and Public Administration Index (PAPI) reported experience with bribes in the health sector. Informal payments appear in various forms and are described using a number of different terms such as tien cam on (money to express thanks), phong bi (an envelope) or tien dut (bribe). Values of informal payments also vary greatly between lower and higher-level hospitals as well as between rural and urban health facilities, ranging from 50,000 VND (2.50 USD) to 5,000,000 VND (250 USD) with some reported exceptions valued up to several tens of millions Vietnam dong (several thousand US dollars). Participants at a workshop we jointly organised on 6 June 2012, with our colleagues from the Research and Training Centre for Community Development (RTCCD) to discuss the report findings, highlighted numerous challenges faced by patients, policymakers and practitioners in Vietnam’s health care sector. Health managers and staff, representatives of civil society and government confirmed the key drivers of informal payments: Low salaries, over-crowding of public hospitals, pressure on hospitals to have financial autonomy as a result of the introduction of market-based management mechanisms in hospital management, inconsistent professional ethics of medical staff and managers as well as low levels of awareness of patients about the legitimacy of fees and about complaints mechanisms. Finding solutions to address informal payments in health services will not be without its challenges. Existing efforts such as the introduction of disciplinary actions for health workers who accept informal payments and open feedback mechanisms for patients to make complaints have been found to be nominal and not very effective. Discussions at the workshop revealed, that given many different causes of informal payments, solutions will need to be multifaceted, targeting both the technical structures within health systems and also wider social perceptions and behaviours. Improving patient awareness of their rights and official fee rates, improving accessibility and effectiveness of complaints mechanism, introducing and enforcing codes of ethics, improving oversight by elected bodies and independent monitoring mechanisms, and piloting no-envelope programmes in a group of hospitals were just some examples of potential solutions raised. The challenges in cleaning up Vietnam’s health services are no doubt huge, given the complexity of the problem. 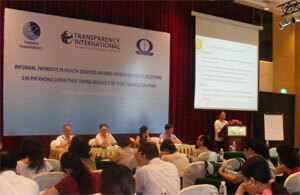 However, the passionate debate ignited at the workshop by senior health representatives, such as the heads of Vietnam’s Obstetric and Pediatric Associations, two departments where informal payments were found to be particularly pervasive, reveals an eagerness from within the health system to make a change. Combined with the finding from the latest Global Corruption Report (GCR) that 80% of Vietnamese can imagine getting involved in the fight against corruption (urban sample), this provides for hope that lasting solutions can be identified.